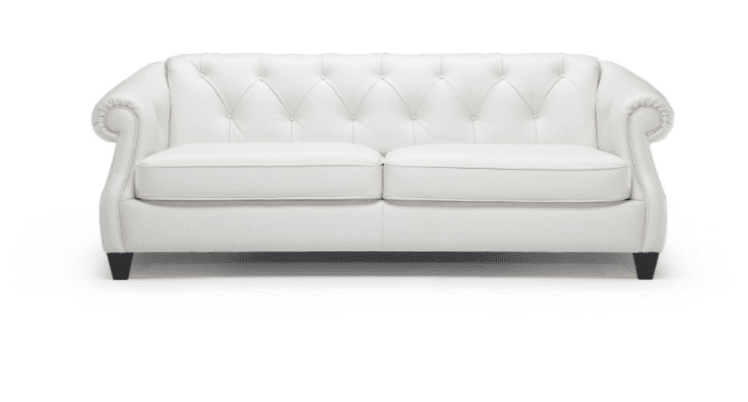 Should I Buy A White Leather Sofa? A living room sofa is so much more than a furniture item. Yes, it’s practical, but it’s also a stylistic focal point. It should fit the style of your home and provide a warm and welcoming place for family and friends. So you may be wondering, should I buy a white leather sofa? It’s the perfect style but is it a risk? There’s a good reason why people are afraid to commit to a white or a light-colored sofa. It’s such a bright, clean, and airy look — perfect for a modern or contemporary living room. But then you think of all the couch dinners, coffee, or wine that may be in that sofas future and suddenly that future doesn’t look so good. Leather Expressions would be right with you if you were looking at a fabric sofa. On the other hand, if you’re thinking about leather furniture we’d say there’s actually no risk. Many people forget that leather is one of the most durable upholsteries. It’s incredibly difficult to puncture, won’t absorb spills quickly, and easy to clean. Our Inventory. Leather Expressions’ weeds through over 700 different leather furniture manufacturers to bring you the very best. We sell the highest quality leather furniture available in a variety of leather colors and sofa configurations. Our goal is for you to leave 100% satisfied with your purchase. Our Expertise. Our expert team has an average experience of 27 years in the industry. Each team member is truly a leather furniture specialist. So stop on by and bring all your questions! We believe the best customer is an informed customer. Our Prices. Leather Expressions cut out the middleman in order to bring you the lowest prices on the market. If you find a lower price on one of our leather furniture items anywhere in the U.S.A. bring in the proper documentation and receive a 10% discount. Come Find the Perfect Sofa for Your Living Room. Stop by our showroom at 927 Bethlehem Pike in Colmar, PA, and experience our luxury leather furniture in person. You’ll never believe the difference that high quality leather makes for both durability and comfort. To speak with the leather furniture experts, please call 215-631-1500 or fill out our online form.